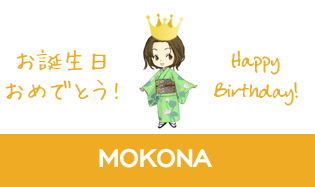 Today is the birthday of CLAMP member Mokona! She’s turning 41 today. Wish she has more hands so she can draw faster. Happy Birthday Mokona-san! I wish you get more beautiful kimono (like Yuuko’s butterfly kimono) to wear. Happy Birthday to Mokona-sama! May she live long and prosper! (it always surprises me when I read the age of CLAMP’s members… I can’t believe Mokona is turning 41! O__o). Happy birthday to her and best of luck *o*! All the best, Mokona! May there be many more years of absolute mind-ripe for your amusement! Well, I wish a lot of health, happiness and fortune. Happy belated birthday Mokona-sensei! I wish her good luck on many many things!!! I know I’m late but Happy Birthday!!!!!!!! !